An artist's conception of the half scale X-33 demonstrator flying over the southwestern desert. The vehicle was a wedge-shaped lifting body, with two vertical fins and a pair of stub wings. On the fins are the Lockheed-Martin Skunk Works logo, which was the prime contractor. At the rear is the aerospike engine, an experimental design that lacked the nozzles of conventional rockets. 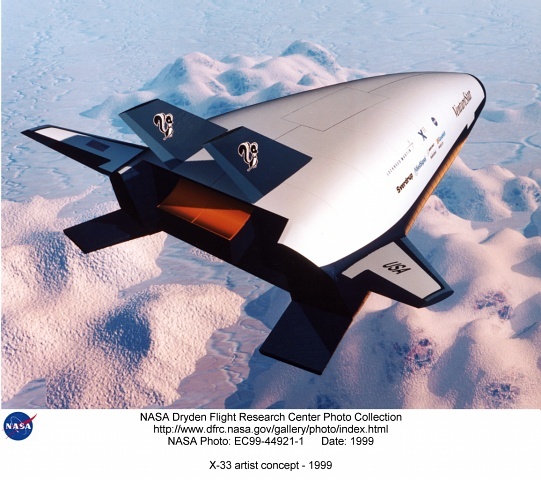 The X-33 tested several other new technologies, including composite structures and a metallic thermal protection system. It was hoped that these advances would lead eventually to an operational single-stage-to-orbit reusable launch vehicle called the VentureStar. However, due to technical problems with the composite liquid hydrogen tank, the X-33 program was cancelled in February 2001.